Altitude Home Entertainment have just releaed the new poster for forthcoming horror comedy "Fanged Up" which hits UK DVD and Digital later this month. 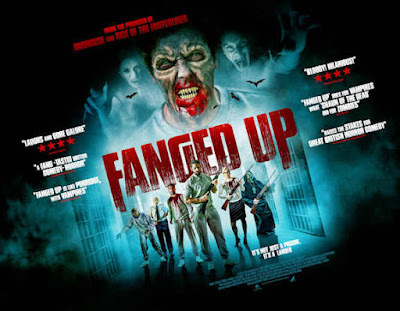 Daniel O’Reilly, best known for his Dapper Laughs persona, fights for his life in a thrilling yet fun horror comedy bursting with British blood and banter alike. Daniel O’Reilly has come a long way since his humble beginnings on Vine, drawing audiences’ attention in his feature film debut as a wise-cracking lad, whose lack of self-awareness creates a likeable lead echoing a modern, more endearing Ali G. O’Reilly finds on-screen support with similarly strong character acting from co-stars Stu Bennett and Vas Blackwood in particular. The cast’s eccentric flavours become succulent ingredients in the horror film stew, providing relatable hooks for us to anchor on, before tearing us apart when the bloody madness kicks in. With the horror and comedy elements in perfect harmony, the creative team have mastered the delicate balance of knowing when to pull a joke, our heartstrings, or just delight us in the blood-splattered spectacle. Ensnaring and entertaining in equal measure, the result is a delicious horror comedy worth sinking your teeth into.